Journal of Environmental Science and Allied Research is a peer-reviewed and open access journal that strives to bring the updated scientific research happening in the field of environmental sciences. 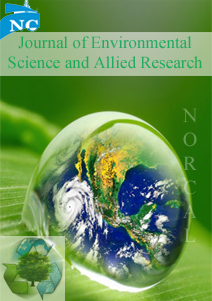 With the significant increase in the environmental issues, NorCal aims to provide a forum by bridging the space between academe and the updated research through the interdisciplinary Journal of Environmental Science and Allied Research. Environmental science is an interdisciplinary academic field that covers a plethora of fields like physical, biological and information sciences including ecology, biology, physics, chemistry, plant science, zoology, mineralogy, oceanology, limnology, soil science, geology and physical geography (geodesy), environmental policies, mining, atmospheric science to the study of the environment, and the solution of environmental problems with substantial new technical developments. We are inviting the diverse research communities to contribute their valuable work to the Journal of Environmental Science and Allied Research. The journal accepts Original articles, reviews, case reports, mini reviews, editorials, short communications etc.